NOTE - Due to technical problems, the site went down Friday morning and didn't come back up until Monday night. (The problem was the "Access Log," which went over 1 GB, causing an "overload of MySQL resources.") Now that it's back I'll be blogging again on Tuesday morning. I could write a book about all that happened these past three weeks in Las Vegas - or does what happen in Vegas stay in Vegas? In my last blog before leaving, June 13, I wrote about my schedule, and it pretty much went as listed. I spent the first week writing 23 articles on the World Veterans - see segment and links below. Then I had a four-day reading/writing vacation. Then we had a three-day camp for MDTTC juniors where they did two sessions/day, about 2.5 hours each. And then a week of coaching at the U.S. Nationals. (See segment below with results.) I'll likely do several blogs on the various happenings, such as the Hall of Fame Banquet, the norovirus stomach virus outbreak (I spent the day before the Nationals sick in bed, along with many others) the USATT board meeting, discussions on national team selection process and hidden serve enforcement, the mini-table tournament, and the $10,000 Jim Butler-A.J. Carney hardbat challenge match. Since this is primarily a coaching blog, I'll start with coaching highlights. We had 16 junior players from MDTTC at the Nationals, with seven coaches. Each night Wen Hsu from the HW Global Foundation (which runs the Talent Development Program at MDTTC - I'm one of their coaches - and raised the money to fund our coaches to the Nationals) posted our coaching schedule for the next day. I was primarily responsible for three players. The key to great coaching at a tournament is players who are prepared!!! Coaching a match can seem like pushing buttons, but if you push the button for a short serve and get a long serve instead, you aren't going to be successful in your "coaching." Fortunately, the players were well prepared, both before arriving in Las Vegas and during the three-day camp. It's the player's responsibility to be prepared, and the coach's responsibility to make sure they are prepared and to know what the player can do - and if they work together, you get pretty good results. Coaches often get credit for tactical advice, but the players have to have developed the tools needed, and be able to execute them under great pressure. That ain't easy! I had two coaching highlights on the first day. A kid I was coaching was down 0-2 in games and 8-10 match point to a player rated over 200 points higher. I called a timeout and said, "Serve fast no-spin to his middle. If it works, do it again." I knew the player could do this serve - he'd been practicing it. Sure enough, the opponent missed it - both times! The player did it again at 11-10 to win the game and went on to win the match. Perfect execution. Later that same day I had another kid down 0-2 in games and at 9-all in the third, also against a player about 200 points higher. (I mistakenly told some he was also down 8-10 match point, but had the score mixed up.) Again I called a timeout, and again said the exact same words: "Serve fast no-spin to his middle. If it works, do it again." Once again it worked, the player deuced it, and went on to win in five! Perfect execution. Later in the tournament I coached a pair of kids in one of the rating doubles events. They were up against a pair of elderly penhold hitters. They were down 1-2 in games and 4-9 in the third, but I didn't call a timeout yet. They scored three in a row to make it 7-9. Then, controversially, I called a timeout. Normally you don't call a timeout when your team has just won three in a row, but I had my reasons. They were about to serve, and I wanted to go over the serve with them. The kid serving had a tendency to serve deep, which he sometimes got away with here since the receiver couldn't loop. But the previous time he'd served the opponent had hit those serves. I told him to focus on doing a slow, spinny sidespin tomahawk serve, and with his back to the opponents, even had him shadow-practice it. Then he went out and did the serve. Perfect execution! Sure enough, the receiver pushed it about five feet to the side - twice in a row! They went on to win the match. Several of the kids discovered the value of a simple short no-spin serve to the middle, while faking backspin. They do this in practice, but against players who they play regularly and so are used to it. Against new players, the balls were often popped up, pushed back weakly, or flipped erratically, and without any extreme angled returns (as is easier to do against serves to the forehand or backhand). They were able to serve and attack over and over off this serve, especially by mixing the no-spins up with backspin and sidespin serves, and sudden deep serves, and by varying the placement. I also ran the USATT Coaching University Serve & Receive Tactics Seminar on Tuesday night. The lecture & demos went 90 minutes, then I stayed another 30 minutes working individually with players who stayed late to practice. I went pretty much by the topics listed on the flyer. One change - the flyer has "Long Serves" and "Short Serve," which I changed to "Long, Short, and Half-Long Serves." During my three-week trip I read nine books (often in the hot tub at night and in bed afterwards), wrote three new short science fiction stories (during the four-day reading/writing vacation), and saw two movies ("The Incredibles 2" and "Jurassic World: Fallen Kingdom"). Here are the results! (Set dropdown menu at top to "2018 US Nationals.") The event was held in Las Vegas, July 2-7. Here are two feature news articles by Matt Hetherington. They were held in Las Vegas, June 18-24. I was there doing daily online news coverage and ended up writing 23 stories. Here are some links. Here's their home page, with results, etc. The USA Boys' Team is in the final against Argentina, the USA Girls' Team in the final against Canada. Here's their news page - lots of stuff was posted during my 3.5 week hiatus. Most recent news items are on the Pan Am Junior Championships. Here's the article by Matt Hetherington. Alas, I had to miss this meeting as it was inadvertently scheduled at the same time as my Serve and Receive Tactics Seminar (which had 33 players). Individual or Group Table Tennis Coaching? Table Tennis Speed, Spin, Power, Who Wins? Here's the most recent newsletter from Tom Lodziak. Here's the article from Ping That Pong. Here's the article from India Today. I Need One More Day - Really!!! After being away 3.5 weeks, I returned on Monday to an overwhelming todo list that took half a day just to put together. I need one more day to tackle that list before returning to daily blogging. However, the Tip of the Week is up: Pinpoint Your Weakness and Then Pinpoint a Drill. And here's a video (24 sec) of someone playing with an oven tray. Don't tell me you haven't dreamed of doing that! I am writing numerous daily articles for the World Veterans Championships in Las Vegas, June 18-24 (along with Matt Hetherington and Richard Finn). Come on over and read these articles that feature such champions as Istvan Jonyer, USATT Hall of Famers, many more! As noted below, I'll be out of town 3.5 weeks. See you in July! A detailed, day-by-day schedule of the next 3.5 weeks. June 14-17 (Thu-Sun). I fly out to Eugene, Oregon with dozens of others for a remembrance of my father, who died in December. Will also spend some time going over his estate and belongings, including literally thousands of books. June 17 (Sun). I fly to Las Vegas for three weeks. I'll be staying in the Westgate Hotel. I'll attend the World Veterans Opening Ceremonies at 8PM. There are about 4000 entries. June 18-19 (Mon-Tue). Group Qualifications for Singles and Doubles. (Doubles starts on June 19.) I'll be doing daily online coverage the entire event, June 18-24 - there should be links at the World Veterans page and on the USATT News page. (Due to shoulder problems I'm not playing, though the shoulder is mostly healed now.) I'm looking forward to meeting one of my three big heroes from when I started playing in 1976 - Istvan Jonyer, the 1975 World Men's Singles Champion. (Click on "Medal Record - Show" on the right.) The other two were Stellan Bengtsson and Kjell Johansson. Stellan will also be at the World Veterans but since he moved to the U.S. many years ago I've gotten to know him pretty well, and look forward to seeing him again. I plan to discuss some USATT policy issues with him. June 20 (Wed). A traditional day off at the World Veterans so everyone can rest. There will be sightseeing tours and the 2019 World Veterans Tour Kickoff Party. However, I probably won't be attending any of this as there'll be an all-day USATT Board Meeting with a packed agenda. June 21 (Thu). Single Elimination Stage in Singles, played to SF. June 22 (Fri). Single Elimination Stage in Doubles, played to SF. June 23 (Sat). Semifinals and Finals of all Doubles and Consolation Events. June 24 (Sun). All Championship Semifinals and Finals played. Award Ceremony presented by Bluestone Designs (Singles events and Closing ceremony. "Viva Las Vegas" Farewell Party presented by Patty Martinez Wasserman and Si Wasserman. June 25-July 1 (Mon-Sun). I have a one-week writing & reading "vacation" in Las Vegas. I'll likely be working on both table tennis and science fiction writing projects. Most of the Maryland juniors (16 of them) are coming in early before the Nationals so I'll also be helping them train the last three days of this. I may see a few Las Vegas sites - see last item below. July 2-7 (Mon-Sat). The USA Nationals. I'll be one of the five MDTTC coaches on hand to coach the juniors from MDTTC, who are mostly from the HW Global Talent Program which trains at MDTTC. Due to the shoulder problems I won't be playing, which means I can focus 100% on coaching. But I should be fine now warming players up for matches. July 5 (Thu). The Hall of Fame Banquet is that night. I'll be there accepting the USATT Lifetime Achievement Award. Those being inducted into the Hall of Fame are Li Ai, Dhiren Narotam, Norman Bass, Doru Gheorghe, and Henan Li Ai. Here's the USATT Announcement. I have to give an acceptance speech - have it all planned out! It ends with a Top Ten list. July 6 (Fri). The Men's and Women's Singles Final will be played that night. July 8 (Sun). I have a free day here where I planned originally to rent a car drive out to the Grand Canyon for some sightseeing. However, for some reason I thought it was two hours away, but it's actually over four. So I'll likely stay in Las Vegas. I looked over the list of Las Vegas Attractions, and will likely visit the following: Titanic Exhibit, The Aquarium at the Silverton Hotel, Mandalay Bay Shark Aquarium, and the Mob Museum. Then, at 10:40PM that night I take a red-eye flight back to Maryland. Here it is, for those of you who missed it before. It was created by Matt Hetherington. Root of the Problem: Are you looking for it? Here's the article from Samson Dubina. Here's the article and six videos from this camp run last week by Samson Dubina. The videos include a highlights video and five lectures/demonstrations. Here's the new series of videos from PingSkills, which are free. "Our latest set of tutorials titled training 101 is now complete and available on the PingSkills website. There are 10 lessons designed for someone just starting out in table tennis or for someone looking to coach someone new to the game. Each session builds upon the last and presents some fun activities to help learn all about the important strokes in table tennis, and of course how to spin and how to counter spin." 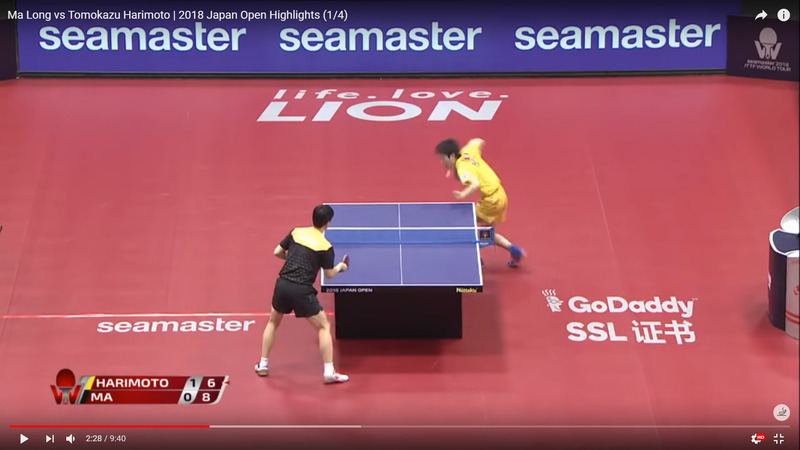 Tip and Drill of the Week - Watch Tomokazu Harimoto and Ma Long playing in a match and isolate their leg movement. Then think about how you can move in a match. How to Backhand Flick Like Fan Zhendong! 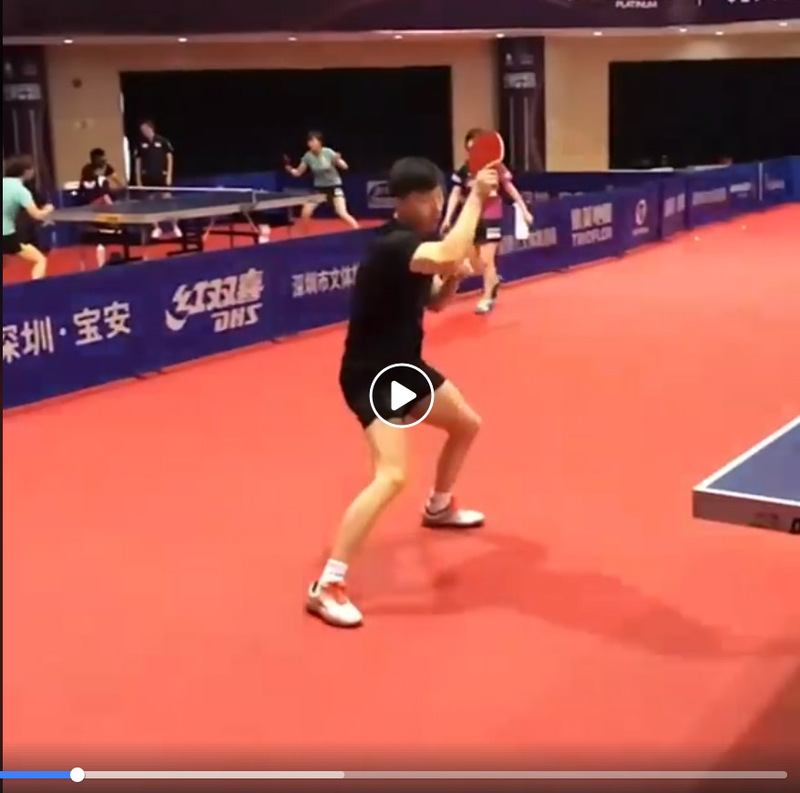 Here's the video (2:40) from Table Tennis Daily. Here's the video (3:41), where they demonstrate the opposite of the banana flick (or flip). Here's another, the Xu Xin Strawberry Flick (4:41). Here's the article from the South China Morning Post (in English). Here's the article featuring Lily Yip, from App Magazine. Here's the article by Coach Jon. "It turns out that there is a lot to be afraid of in table tennis!" Here’s chapter 3 of Tim Boggan's latest volume, which covers 1993-1994. Or you can buy it and previous (and future) volumes at www.timboggantabletennis.com. Volume 21 is 438 pages with 1667 graphics, and covers all the wild things that happened in 1994-95 - and I'm mentioned a lot! Why not buy a copy - or the entire set at a discount? Tim sells them directly, so when you order them, you get it autographed - order your copy now! Here's the article. The full title is, "Research on real – time tracking of table tennis ball based on machine learning with low-speed camera." Here's the video (12:33). 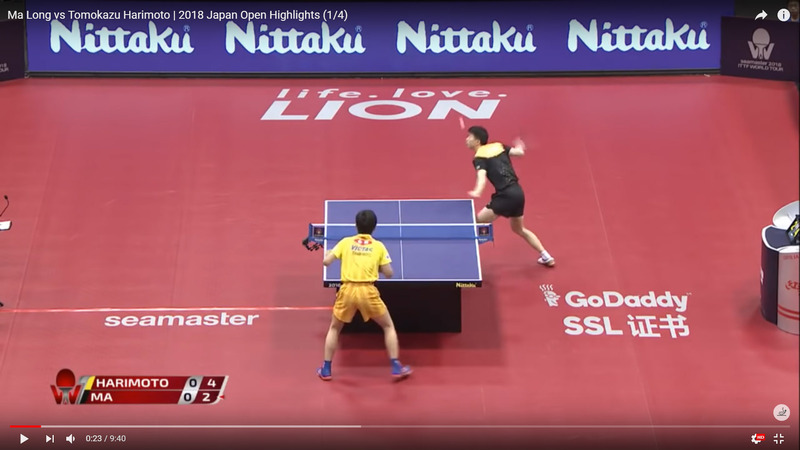 Note - I linked to videos of the Tomokazu Harimoto-Zhang Jike Men's Final on Monday, along with Harimoto's SF with Lee Sangsu and QF with Ma Long. 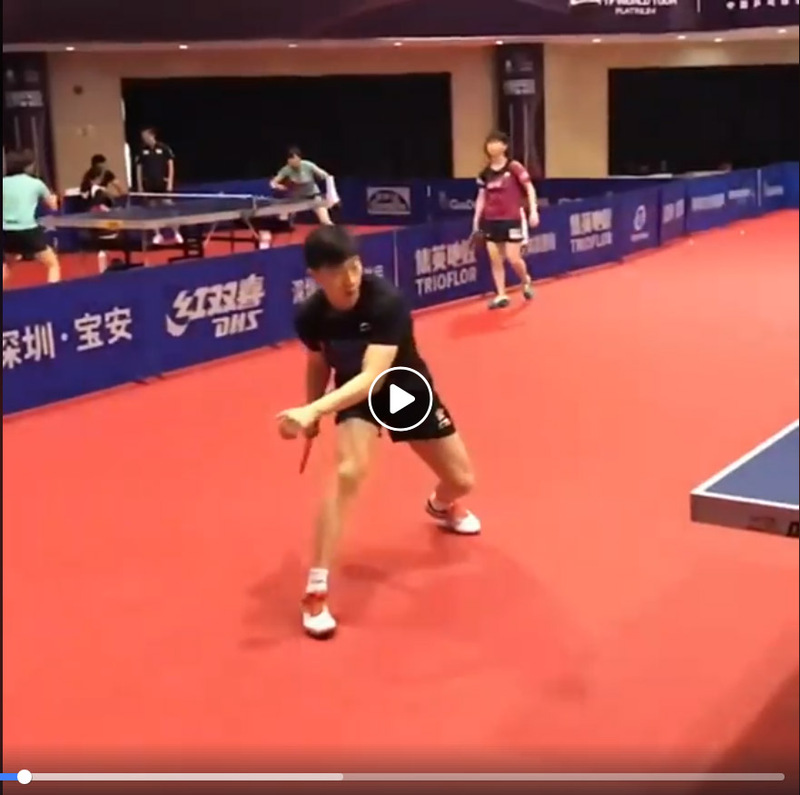 Here's the video (60 sec) as the two put on an impromptu exhibition at MDTTC. Here's the article and video (2:31). Here's the video (6:05) from Park City Television. Here's an interesting selection from Fitness Magazine. Here's the video (70 sec) of trick shots. I most appreciate the very first one, through the house of cards. Think about it - when trying this out, every time he missed he had to rebuild the thing! Here's the page with it. Scroll down further and you'll get the "Come Along Ping Pong Paddle" at the Barbican." Here are a few. Just Google "Table Tennis Cartoon ANIMAL," and replace ANIMAL with your choice of, well anything. "Cartoon" is optional. I have a bunch of work being done on my house early on Tuesday morning, and a horde of things on my todo list to get done before I go out of town Thursday morning for 3.5 weeks. So no blog on Tuesday. See you on Wednesday! That, alas, will be my last blog for 3.5 weeks, where I'll be at a family gathering for three days in Eugene, OR; and then three weeks in Las Vegas - the World Veterans (one week); a one-week writing/reading "vacation" (though I'll also be helping to run a 3-day mini-camp before the Nationals); and then the USA Nationals. How to Make Your Strengths Stronger with Serve and Receive. Before this tournament, Harimoto was ranked #10 in the world, and that seemed accurate. Now? I'd say he's firmly proven that he can compete with the very best. Does this mean he's better than Ma Long? No - I'd still bet on Ma Long next time out. But I think Harimoto should legitimately be #3 or #4 in the world. At this point, he's on a par with Ovcharov, and breathing down the necks of Ma Long and Fan Zhendong. I suspect that part of this is because of the removal of Liu Guoliang as head coach last year of the Chinese team. He was great at preparing players for each event and each match. There's a really good chance that he would have better prepared Ma and Zhang for Harimoto. This type of thing makes a big difference. But we'll never really know, will we? We just know that while Liu was coach, the Chinese dominated and beat all challengers. As soon as he left, the elderly Timo Boll and Ovtcharov began to challenge beat them, and now a 14-year-old is beating them. Being the youngest to win a Pro Tour Event isn't a guarantee of great success. Before Harimoto broke his record, the youngest male Pro Tour winner was China's Yu Ziyang, who won the 2014 Japan Open at age 16. Yet his highest world ranking ever was #20, and he's currently listed as #372 (mostly due to inactivity). But Harimoto seems a lot higher in level than Yu was, so barring injuries or unforeseen happenings, I can't see Harimoto not becoming the dominating best in the world in the next few years. Harimoto wasn't the only Japanese player to upset the Chinese - Mima Ito won Women's Singles. See Japan Open below and article on Japanese Teenagers. So, how is Harimoto at age 14 able to compete and win against the world's best? I watched videos of his matches at the Japan Open, and especially against Ma Long. Here are the quarterfinals, semifinals, and final of the Japan Open for Harimoto. Here are six things he does about as well or better than anyone else. While I don't really like the spectacle of a 14-year-old on the world stage screaming like a banshee every time he wins a point, I understand why it happens and why it helps him play. There's a lot of tension and pressure in these matches, and the screams help vent that tension. As players get older, they learn to control this, which is why most of the best players in the world in most sports don't scream as much, only perhaps at key points. But for a kid, it really helps to release tension in this way. It also helps in focusing, which is also easier as one gets older. And lastly, it does distract and irritate opponents, which can affect their play. So whether we like the screaming or not, we have to understand that they are part of what makes Harimoto so good. It's likely that as he gets older he'll quiet down, but not necessarily. Backhand banana flip. Especially in returning serves he does this as well as anyone on the planet. The result is he can take the initiative when receiving as well or better than just about anyone. A key point - develop this shot early. Most coaches don't teach this shot until the player is relatively advanced, and then he's years behind a player like Harimoto who was probably trained on this shot early on. Off-bounce backhand loop. I'm starting to suspect he does this better than anyone, and he makes it look easy. What makes the shot so strong is the combination of quickness, speed, topspin, and placement. Every time he's in a topspin rally he's a threat to end the point with one of these off-bounce shots. Others may have more power on it, but I'm not sure if anyone combines the best of every aspect of this shot. Here's the last point of his match with Ma Long - see how he rips a backhand off-the-bounce to Ma Long's middle, who can barely even react to it. (The shot itself was set up by a banana backhand flip.) Coaches should study the stroke and how he generates so much power with such a short, quick stroke - in some ways reminiscent of Bruce Lee's famous short punches. It's actually easy to copy the stroke without the ball (after watching Hashimoto do it) - the key is training this type of backhand until you can do it in live rallies like he can. Attacking middle and then corners. He's extremely good at going after opponent's middles, i.e. their playing elbows, with his extremely quick topspins, and then following up with winners to the corners. Over and over he did this with Ma Long and others. Often the first shot to the middle won the point outright. (See last point of match with Ma Long above.) A key point is that when he went to the middle, he did so with very quick, off-bounce shots. Forehand without backing up. He doesn't nearly have the power of Ma Long or Fan Zhendong (yet), but his forehand is quicker, allowing him to take nearly every ball without backing up. Off a hard-hit shot I'd guess he takes the ball on average a full foot quicker than Ma or Fan. This puts tremendous time pressure on opponents, and makes his placement even more effective as players struggle to cover for these quick, aggressive topspins right at their elbow or at wide angles. On most shots, he can still loop at full power, but when rushed, he sacrifices speed for quickness and angles. Better hidden serve technique. At the higher levels, most players hide their serve, either over and over, or sparingly to catch opponents off guard. I've blogged about this many times, and consider it a travesty on our sport that we allow such cheating, but it's a reality, and Harimoto would have great difficulty competing at this level if he didn't do it as well. But he's one of the best at it as he shows the ball right up until nearly contact, fooling spectators, umpires, and even opponents into thinking the ball isn't hidden. But just as he's contacting the ball his head thrusts out just enough to barely hide (or sometimes not, to keep receivers guessing) contact, and with a quick, hidden motion, he can change the spin or give no-spin, and opponents have difficulty figuring out what the racket was doing right at contact, often getting fooled by what it was doing a split second before or after. Here's the home page for the event, which ended yesterday in Kitakyushu, JPN, June 8-10. Here are some key articles - there are many more in their News section. Results are linked from the Information section. Here's the article and video (1:20). Here's the video (34 sec) from the European Table Tennis Union. Here's the interview by Ayan Bagchi. "Ms. Iva Laginja is a 25-year-old Croatian born Austrian who moved to Baltimore, MD eight months ago to work at the Space Telescope Science Institute. She has recently completed her Master’s degree in Astronomy and Instrumentation from Leiden University (Netherlands) and two undergraduate degrees in Astronomy and Physics from the University of Vienna (Austria)." ITTF World Junior Circuit - Where is USA? Here's the article by Bruce Liu. While I believe it was the rise of full-time training centers that led to the rise of USA's juniors - you can't compete with the full-time training overseas if all you mostly have part-time players training in part-time clubs, which was the USA reality until full-time clubs began popping up, mostly in the last 10-15 years - he makes a good point that bringing the World Junior Championships or a similar event great spurs table tennis activity, as he explains. Here's the ITTF article on the 2018 Cook Islands Junior and Cadet Open in Rarotonga. Here's the video (7:14) featuring Sid and Nandan Naresh. "12-year-old Sid Naresh and his 10 year-old brother, Nandan, already have their eyes set on playing professional table tennis." Here's the video (58 sec). Don’t Suffer from the Same Nightmare as Timo Boll! Here's the video (2:01) from Pongfinity. Here's the video (45 sec), which I posted on Tuesday, of the point between Timo Boll of Germany (world #4) and Liang Jingkun of China, world #82. Let's look at it shot by shot. (Use the space bar to start/stop the action, and the left arrow to bring the video back 5 seconds - at least that's what it does on mine.) Note that Liang will end up pulling off the upset, -5,9,10,-7,-4,9,5. At the time of this point, Boll is up 3-2 in games but Liang leads 9-5, and 9-6 after this point. Liang's serve. It's hidden, of course, since umpires these days almost never call hidden serves - or more specifically, don't call serves where they are not "satisfied" that the serve is legal. When a player contorts his body like this and then thrusts his head out just as he's about to contact the ball, there's no way an umpire can be "satisfied" that the serve was not hidden - he simply can't tell from his angle, meaning he cannot be "satisfied" the serve was not hidden, meaning there's no gray area anymore - the serve is illegal, period. See Rule 2.6.6: "It is the responsibility of the player to serve so that the umpire or the assistant umpire can be satisfied that he or she complies with the requirements of the Laws." Watch the video - see how he thrusts his head out just before contact? Here's a screen image. Pretty clearly illegal, isn't it? But it isn't called, and there's no push by the ITTF, USATT, or any of the Rules or Referee/Umpire Committees to do anything about this pervasive cheating in our sport because cheating has become part of our table tennis culture. (There is some nuance here - cheating means to "act dishonestly or unfairly in order to gain an advantage." Therefore, the first person to hide his serve is cheating. If you respond by hiding your own serve, you are not doing so to "gain an advantage" - you are doing so to take away the opponent's unfair advantage.) At the world-class level, players are used to it, and so have learned to read the spin by how the ball travels through the air and bounces on the table, but it leads to more passive returns, like Boll's here, and more mistakes. Below the world-class level it can cause havoc. Boll's return. It's a relatively weak return, probably because of the hidden serve. But he deadens the ball some so that the table is partly in Liang's way so he can't wind up with full power. Liang's follow. He makes a strong forehand loop into Boll's wide backhand. Boll's block. It's extremely well placed, to Liang's middle, forcing Liang into an awkward position. Liang's second loop. Despite the awkwardness of his position, Liang uses his upper body to loop rather strongly to the middle of the table. This is a technique that was originally developed by pips-out penholders, then adopted for looping by 1993 World Men's Singles Champion Jean-Philippe Gatien, and now common by top players caught in the middle - it allows you to make a strong shot while staying right at the table. It's not really to Boll's middle, since Boll was already off to the side and in position for this, but it puts Boll out of position. Boll's loop from the middle. He makes a decent loop, but not particularly powerful, and it's not that well placed, going right into Liang's middle backhand. This is where Liang gains the advantage. Note how while Liang took the ball almost off the bounce from the middle, Boll takes the shot from the middle a little further back, which gives Liang more time and a bigger angle into the forehand. Liang's angled block. With Boll caught out of position and with a big angle to Boll's forehand, Liang does exactly that. Note that he didn't just blocked - he backhand topspinned off the bounce. Boll's awkward return from wide forehand. He's caught out of position, and so is almost falling back as he practically lunges for the ball, setting up Liang for a likely winning shot to the now open backhand side. Liang's shot to the open backhand. He should have ripped it, but instead seems to hold back a little for safety and doesn't really angle it well. I haven't seen Liang play before, but his Chinese teammates (Ma Long, Fan Zhendong, Zhang Jike, Xu Xin) would have ripped this shot. Boll's hand-switching shot. Liang's failure to rip the ball or go for a wider angle is all Boll needs for this spectacular hand-switching shot. Liang's counterloop. When someone suddenly switches hands on you like this, the ball comes at you different than you expect, and so Liang makes a surprisingly good recovery with this counterloop. Boll's backhand loop. Just a nice shot. It completely catches Liang off guard. Except . . . .
Liang's weak but well-place forehand. When you have to make a weak return, place it well, and that's what he did here. He also sidespin looped it so it broke even more into Boll's backhand side. Liang has the advantage here, and it seems there's nothing Boll can do that won't set up Liang for a strong forehand. Here's the home page for the event, which takes place in Kitakyushu, JPN, June 8-10, starting tomorrow. Here they are. On the men's side, they are a bit saner than before with the best player in the world, Ma Long, moving from #6 to #2, after Fan Zhendong, the second best player in the world. (I think Ma has beaten Fan the last three times - that's what someone told me though I haven't checked it.) Overall, for the first time since they began the new system, the rankings look rather accurate on the men's side other than this. On the women's side, it's still hard to fathom that Ding Ning is #12, when she should be at the top with the other top Chinese - Chen Meng, Zhu Yuling, Wang Manyu, and Liu Shiwen, with Kasumi Ishikawa of Japan (#4) the only non-Chinese to break up that murderer's row. Here's the article by Eli Baraty. "Each point is evidently different and no player plays the same way! But there are three different ways we approach a point or match." Here's the video (7:55) by Tom Lodziak. Response to "Shut Up and Just Play"
Here's the article by Sean O’Connell. Here's the ITTF video (5:42). Here's the video (64 sec) from Maria Ingles. I may try this out in my beginning junior class! Here's the video (41 sec)! Many, perhaps most, consider Jan-Ove Waldner the greatest player of all time. I've never played him, but I've met and talked to him many times, even had lunch with him and other top Swedes when I interviewed them for an article. What would happen if he were in his prime today? First, note that "greatest" is not the same as "best." Victor Barna is one of the greatest players of all time - he won Men's Singles at the Worlds five times. But I'm pretty sure that if I could go back in time when I was at my peak and play him when he was at his peak, using the rules at the time, I'd beat him easily, since I'll using Tenergy and throwing loops and serves at him that he's never seen before, and he'll be stuck with a hardbat. Similarly, the best modern swimmers are all faster than Mark Spitz, but he won seven gold medals at one Olympics, setting a world record in each of them. The best modern swimmers are better than Spitz, but Spitz was greater than all of the ones not named Phelps or Ledecky. Getting back to Waldner, I think Ma Long has a better game than Waldner. He simply has too much firepower. But there's a catch - that's only after he's played Waldner at least once, perhaps more. Players who have played Waldner pretty much all report the same thing about, how uncomfortable it is to play him with all his misdirection, change of pace, and variety. These days nearly all coaches turn players into mini-Ma Longs or something close, and so the things that Waldner did to make players uncomfortable is mostly a lost art. It's not a matter of a player suddenly deciding he's going to try to change the pace or use misdirection; he'd have to have done it since he was a kid, while developing, so it's natural and instinctive, as it was with Waldner. Then you use these techniques as just another part of your game, to be used at the appropriate time, while focusing on the modern all-out two-winged looping game. Keep in mind that as good as Ma Long is, none of his shots are that much better than Waldner. He has a slightly better forehand, slightly better backhand, slightly faster footwork, and with his banana flip, is better at attacking short serves with his backhand. (In fact, that's probably the shot where he's most ahead of Waldner.) But Waldner had a masterful forehand - not quite as powerful as Ma Long, but dominant because of placement and consistency. Ma Long also has a better backhand attack from close to the table, but Waldner mostly (not completely) offsets that with his more all-around skills - he can loop, hit, or block, and his blocking is far better and among the best ever. Shot for shot, Ma Long seems to have an edge in almost any type of rally, though Waldner had more dominant serves, among the best of all time. So what is my conclusion? If Waldner were to suddenly show up in his prime, and ignoring the nitty details about the different ball size, etc., I think he'd cause havoc at first. Keep in mind that Timo Boll is 37 and still one of the five best players in the world - and he was never as good as Waldner at his best. In his first outings with Ma Long and Fan Zhendong, Waldner would give them great difficulty as they adjust to a game they haven't really seen, while Waldner will be a bit more comfortable against their styles. I'm not sure who would win at first, but I think it would be close at the start. But after they've played a few times, Ma Long's overall game would prevail, and Waldner would drop down a few spots in the rankings - my guess is he'd be #3, after Ma Long and Fan Zhendong, and he'd battle with them as well or slightly better than Timo Boll and Dimitrij Ovtcharov. But the repercussions of Waldner showing up now in his prime? Suddenly the things he does that few others do would once again be on display. Players would see how effective it is to have misdirection, change of pace, and variety, and want to add those aspects to their games. And coaches would have a pretext to teach this part of the game early on, where before they felt compelled to teach only the "modern" game of relentless attack. Perhaps rather than attacking ten balls it would be better to throw something different 10-20% of the time, and catch the opponent off guard as Waldner did so well? Of course, one problem is that most of the stuff Waldner does that I'm talking about was self-taught, so it's more important for a coach to encourage and guide it while the player experiments and finds out what works and when. You don't just throw a change-of-pace or misdirection shot at an opponent who is in position and ready for it - you do it when it will catch him off guard and set up a follow-up shot. The key point is that the modern game is more advanced than what players did in the past, but that we've gotten so much into turning players into clones of the current best that we ignore aspects of the game that, if developed, would enhance their games. Here's the video (50 min) from PingSkills. "In this episode of the PingSkills we talk about how we got started with table tennis, we talk about a young Timo Boll, and we answer some of your table tennis questions." Here's the USATT announcement by USATT High Performance Director Jörg Bitzigeio. Here's the USATT article by Richard Finn. "In his prime Sir Peter Snell of New Zealand was one of the most accomplished and decorated middle distance runners of all time." … "Long retired from running, today as he approaches his 80th birthday Snell has adopted he same attitude to competing in his most recent athletic endeavor table tennis as he did when he was an Olympian. Here's the ITTF article. "Success at the recent Seamaster 2018 ITTF World Tour Platinum Kaisa China Open in Shenzhen means that Ma Long is just one win short of equalling the all-time ITTF World Tour Men’s Singles record of Vladimir Samsonov of Belarus, the owner of 27 such titles." Here's the ITTF article. "Like Wang Manyu from China, Guo Yue won four times in 2007 but the player to catch is their Chinese national team colleague Zhang Yining." Here's the article and video (35:06) by Brian Crisp of this tournament held this past Saturday in Atlanta. Here's the article featuring table tennis hardbat & sandpaper star and actor Adoni Maropis. "We’re excited to announce THE FIRST of several Special Guests attending the Tenth Annual PingPongforCHARITY™ Events with Christian Laettner and Friends." … "Adoni has won the National Championship and US OPEN Championship in Hardbat and Sandpaper Ping Pong and represented the USA at the World Championships of Ping Pong twice at Alexandria Palace in England." Play Ping Pong with Scissors (4:06) - they also play using mirrors to see the ball, do various around the net shots, play with ping-pong balls as rackets, play with two balls and two racket (each), and other tricks. Footwork at Different Physical Levels. They were held this past weekend. My write-up (along with links to photos) is up at the USATT News site and the Butterfly News site - take your pick! The Butterfly one features a picture of the Under 4000 Doubles Finalists - and those two little 9-year-olds in the middle, Mu Du and Stanley Hsu, made it to the final, losing 15-13 in the fifth. They are rated 1789 and 1976! (Read about their exploits in the tournament article.) USATT featured the Open Doubles finalists, with Lidney Castro/Martin Jezo the winners over Jeffrey Zeng/Wang Qingliang. Here are the ratings from the tournament, which went up yesterday. 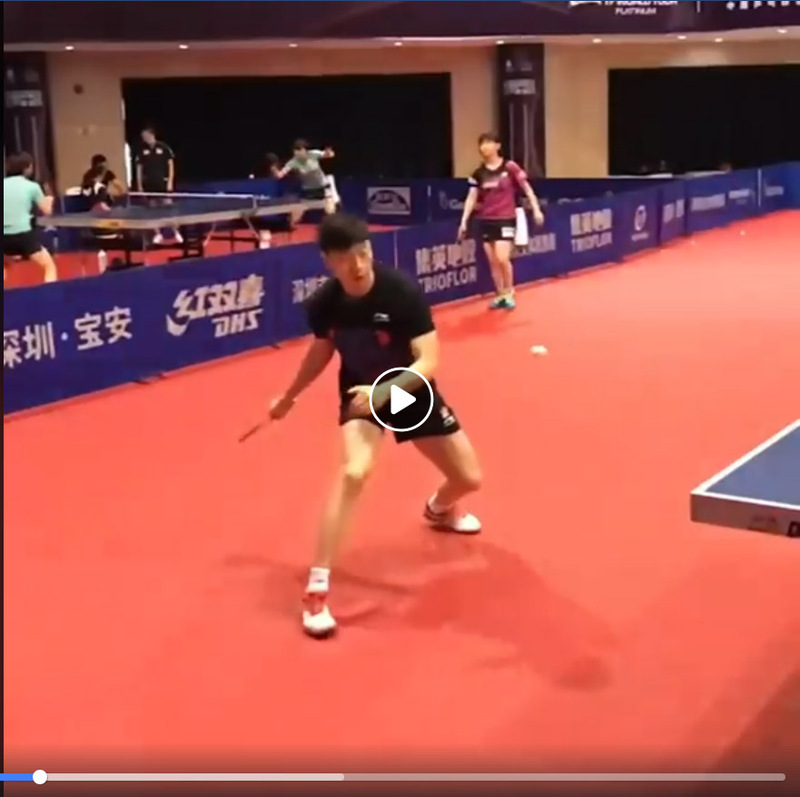 And in case you missed it from my mini-blog yesterday, here was the Point of the Tournament (55 sec), from the Men's Singles final between Lidney Castro and Wang Qingliang, care of PongMobile - the foremost way to view ratings! Running a tournament can be exhausting. I think I received more emails and phone calls in advance of this tournament than just about any other I've ever run - and this was the 201st USATT sanctioned tournament I've run, all but two of them two days long. That makes exactly 400 days of running tournaments. This weekend I opened the club at 7:45AM each morning (play started at 9AM), and was there until 10:30PM both nights. I was also there from 6-11PM on Friday setting up (with great help from Mossa Barandao and Wen Hsu, as well as during the tournament). But I spent a huge amount of time the week before the tournament with those emails and phone calls. (And don't get me started on the time spent before that on scheduling, selecting and ordering trophies/plaques, and the zillion little things that you have to remember to do or the whole tournament comes collapsing down like the pyramids of plastic cups the younger kids like to construct and then knock down by smacking forehands and backhands. Sunday from 4-5:30PM I ran off to the back tables to run the Beginning Junior Class, while Mossa and Wen kept things going at the control desk. The day's feature, after a bunch of standard drills, was backhand-to-backhand - how many can you do? Grace joined the 100 backhands in a row club - and she did 100 forehands last week. This morning I was going to write about how Waldner would have done if he played at his peak now, but when I got up this morning the power was out in my house - I have no idea why. It didn't come back on until about 9AM, and since I'm running short of time, I'll hold back on the Waldner blog until tomorrow. Writing about the tournament is quicker! 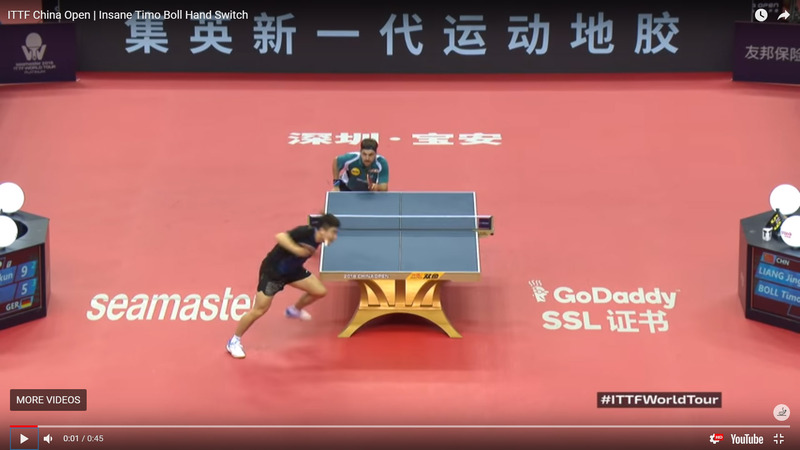 Timo Boll Hand Switch at 2018 China Open! He's done it again - here's the video (45 sec, including slo-mo replay). But that's not the most interesting thing about the rally - look at what he does two shots later to win the point! Replay it a few times. Here's the ITTF home page for the event (results, articles, pictures, video), which was held this past weekend in Shenzhen, China. Check out the results! Here's the newsletter from Tom Lodziak, with links to coaching tips. Here's the article by Larry Thoman about the new line of robots that just came out. I normally shy away from equipment articles due to conflict of interest - I'm sponsored by Butterfly - but this is rather new. "Butterfly launched a refresh of its highly regarded Amicus line of table tennis robots at the recent World Team Table Tennis Championships in Sweden. The newly introduced models are the Start, Expert, and Prime models. All are upgraded models from the models they’re replacing—the Basic, Advance, and Professional." Here’s chapter 2 of Tim Boggan's latest volume, which covers 1993-1994. Or you can buy it and previous (and future) volumes at www.timboggantabletennis.com. Chapter 2 covers "June-July 1994 Tournaments." Volume 21 is 438 pages with 1667 graphics, and covers all the wild things that happened in 1994-95 - and I'm mentioned a lot! Why not buy a copy - or the entire set at a discount? Tim sells them directly, so when you order them, you get it autographed - order your copy now! Here's the video (9:05) from Arnaud Scheen. Here's the video (50 sec, including slo-mo replay). I'd love to try this one, and would probably use my forehand where I can smack a ping-pong ball from nine feet better than half the time. Here's the video (1:42) of this song from 1901 (!) played on the original equipment!!! It was sent to me by Steve Grant, who wrote under the video, "Ping Pong Song, by Edward Lauri, 1901, London, playing on a polyphon-like music box. My collection also includes the Edison Bell brown wax cylinder of this same song, sung by Harry Bluff, which I am attempting to play and record. I do not own the sheet music and do not yet know the lyrics. I welcome any help." When I got up this morning the power was out - I have no idea why. It didn't come on until about 9AM. I'll have the blog up by 10:30AM,and if I don't, I'll just pardon myself. Meanwhile, the Tip of the Week is up - Footwork at Different Physical Levels. So why not stand up and do some table tennis footwork practice, away from the table without a ball? That'll wake you up faster than coffee!!! I'm still recovering from two consecutive 15-hour days running the tournament (98 players), and the huge hours before setting it up (with a record number of emails and phone call queries), and as I normally do after tournaments, will take today off from blogging. Alas, it won't be a day off - I have to finish the tournament write-up, photo work, press release, and accounting, plus finalize the June MDTTC Newsletter with all the tournament info. Here are the results of the tournament. 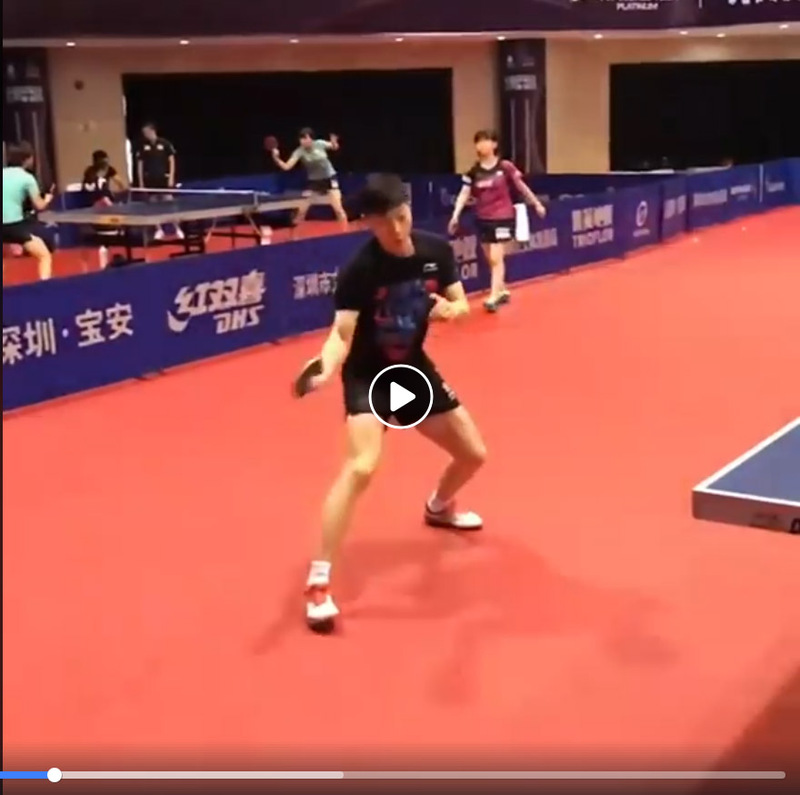 And here is the Point of the Tournament (55 sec), from the Men's Singles final between Lidney Castro and Wang Qingliang, care of PongMobile (the foremost way to view ratings!). For your further TT reading and viewing, USATT put up a number of news items over the weekend. And perhaps this is a good time to rewatch The Ping-Pong Song (3:40, from 2009)!